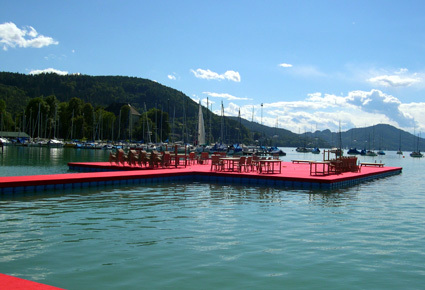 Austrian company AquaTech has utilized 25 years' experience in floatation engineering to develop a system of interconnecting pontoon building blocks that it claims offers unparalleled stability and load carrying capacity. The "Maritime Technic" System is aesthetically pleasing, highly versatile and safe for the environment. Various anchoring options are offered, along with substantial add-on accessories such as swimming ladders, railing posts and boat fastening eyes. Fender systems, UV-resistant ropes and electricity distributors (with or without illumination) are also available. Manufactured from high quality UV-stabilized anti-static material in either blue or green, single modules weigh just 6.2 kg and are easily handled. Each unit measures 50 x 50 x 50 cm (1.65 x 1.65 x 1.65 ft) and has a standard freeboard of 40 cm. Blocks are connected in four places using lugs and a bolt for security. 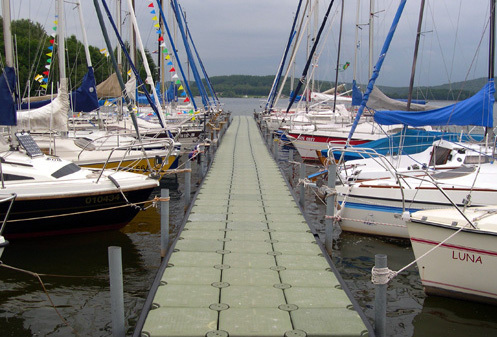 Blocks can be connected to create any desired layout arrangement of any size and can also be used to replace or extend existing pontoon systems. The blocks are salt water and acid resistant and no maintenance or cleaning is required. Systems can remain in place throughout the year or can be stored away in single modules. 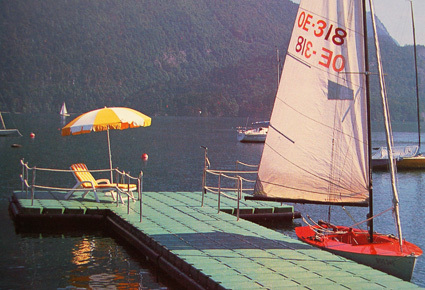 When in use, the pontoon system is slip-proof, has no sharp edges and, of course, cannot splinter or rot. The versatile "Maritime Technic" pontoon building block system from AquaTech benefits from 25 years' experience in state-of-the-art flotation engineering, together with the latest design technology and advanced production techniques. By utilizing the co-efficient of friction achived by independent controlled flooding of modules, the company has been able to provide an extremely stable floating platform with a high load bearing capacity. Made from high quality UV stabilized and anti-static synthetic material in either blue or green, each module measures 50 x 50 x 50 cm with a standard freeboard of approximately 40 cm. Single modules are easy to handle, weighing just 6.2 kg each, and provide a load capacity of 370 kg/sq m.
Blocks are assembled by joining four modules with a bolt passed through connecting lugs on the corner of each module. The system allows the blocks to be arranged in a variety of layouts to suit specific applications or used to extend existing pontoon berthing. It can be utilized throughout the year or removed from the water, taken apart and the individual modules stored until required again. A range of accessories is available, including boat mooring eyes, fenders and ladders. It is also possible to fit an electricity supply unit with or without illumination. Austrian company, AquaTech, has launched the Maritime Technic - Pontoon System. The modular system provides a stable floating platform which offers a high load capacity and can also be combined with a fender-sidebar system. The single modules are easy to handle (weight: 6.2 kg) and guarantee a load capacity of 370 kg/sq m (815 lbs/10,8 sq ft). They are made of a high-quality synthetic, UV-stabilised and anti-static material (green or blue) which is extremely resistant to the elements. With block measurements of 50 x 50 x 50cm (1.65 x 1.65 x 1.65ft), the standard freeboard is approximately 40cm. Blocks are easily assembled by connecting 4 elements (= 1 sq m) via connecting lugs, with one bolt which gives a secure, stable connection. This building block system can be adapted to any desired layout or measurements and can replace or extend existing pontoon systems. The seawater and acid resistant system requires no maintenance or cleaning and is extremely durable. It can be utilised throughout the year or the single modules can be stacked and stored. Unlike conventional wooden floats, the pontoon is made of a skid-proof material, and will not rot, it is also safer as it won't splinter, or have sharp edges, rusty nails etc. It comes equipped for various anchoring configurations. Main accessories include a swimming ladder, railing post and boat fasteningeye come with options such as fender systems, UV-resistant ropes and, for marinas, electricity distributors are available. Gestützt auf fundierte Erfahrung aus 25 Jahren Schwimmkörpertechnik, reifen in den Produktionsräumen der österreichischen Firma Aquaculture Technology eine neue Generation von Schwimmsteganlagen heran. Dieses patentierte Verfahren basiert auf einem variablen Ponton-Baukastensystem, das seine Stabilität primär dem physikalischen Gesetz der Kohäsion zu verdanken hat. Zusätzlich zu diesem Trennungswiederstand unterstützt die an der Unterseite offene Form des Schwimmkörpers die Stabilität der Konstruktion. Die wartungsfreien Kunststoff-Bausteine (50 x 50 x 50 cm groß und 6,8 kg schwer) sind frostsicher, seewasser- und säurebeständig, UV-stabilisiert sowie verrottungsfest. Für das Winterlager läßt sich das System leicht demontieren und platzsparend stapeln. Durch das Baukastensystem, vier Elemente werden jeweils mit einem Bolzen zusammengehalten, lassen sich beinahe unbegrenzte Flächenkonstellationen auf einfache weise zusammenstellen. Die Tragfähigkeit wird mit 370 kg pro Viererverbund (1 m2) angegeben. Abgesehen von der individuellen Formgebung bieten Optionen zusätzliche Aufrüstmöglichkeiten. So können die ohnehin rutsch- und trittfesten Grundelemente mit einer Holzverkleidung abgedeckt werden. Ferner lassen sich eine Fenderleiste zum Schutz der Anlage oder als Versorgungsträger anbringen sowie Badeleitern an beliebiger Stelle montieren. Boots- und Verankerungsösen sowie Geländerpfosten runden den Zubehörsektor sinnvoll ab. Aquanaut (1994: Heft 5/6, Seite 101. ); Österreichs Fischerei (1994: Heft 7, Seite 180); Yacht Revue (1994: Heft 9 Seite 63); Yacht Info (1994: Heft 9, Seite 46); International Bodensee & Boot Nachrichten (1994: Heft 10, Seite 64); Technisches Wassersport-Journal, Palstek (1995: Heft 5/6, Seite 90); u.v.m.